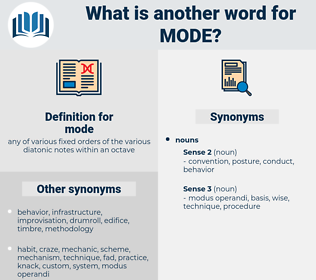 What is another word for mode? dimensions, requirements, schemes, organisations, servants, rules, modality, modalities, manner. 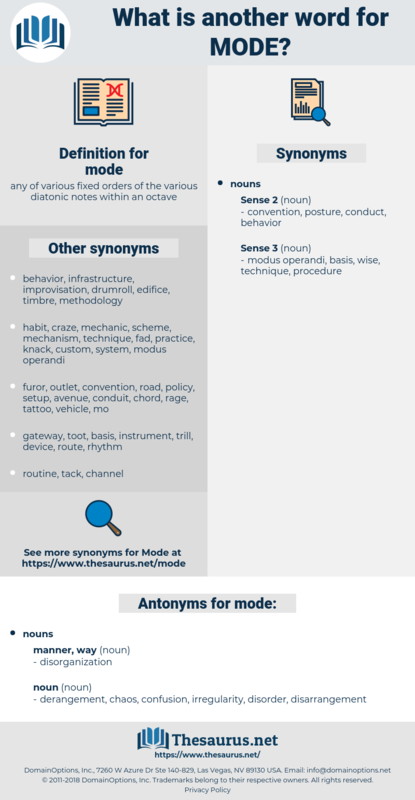 modules, Attitudes, mechanisms, purposes, FORMATS, options, indications, derogations, paradigms, characteristics, regimes, kinds, trends, practices, choices, routines, Styles, Lifestyles, fashions, Formulas, events, amounts, Analyses, avenues, dimensions, Habits, Lives, LINEs, modalities. modality, manner, media, extent, recirculation, token, modelling. Provided, Enabled, permitted, Cycled, used, Believed, Did, Meant, said, made. removes, provides, follows, enables, leads, increases, renders, allows, Leaves, ensures, happens, offers, Does, helps, Gives, refers, shows, brings, takes, serves, applies, lets, puts, makes, modalities. derangement, chaos, confusion, irregularity, disorder, disarrangement. Hence the hypothesis of evolution would be the only probable one, even in the absence of any clue to the particular mode of evolution. Time is only a mode of thought, you know. mammoth, motto, manteodea, mamet, maund, Mohammad, mind, matai, minute, monied, mahound, metadata, may day, moated, matt, moede, mate, manda, made, mimidae, mennonite, manet, mutt, maidu, mid, menotti, minded, minnewit, monnet, mediate, montia, mammutidae, monument, meted out, mandate, mod, monod, mayday, mentha, mountie, midday, mande, monet, mined, mit, md, mead, meade, manned, mammut, mound, MDI, monte, manta, myoid, mott, maidhood, meed, meditate, manumit, maundy, mitt, middy, moat, manidae, moth, meadow, manat, manteidae, mediated, manhood, moneyed, method, moody, mat, mayweed, munda, man-made, maenad, mantua, madia, monday, meet, medea, momotidae, moiety, momot, mad, mend, mantid, mouth, Mahdi, memento, meaty, monody, mite, mounted, midi, miniate, matey, minutia, mahout, mute, minuit, mount, mot, manihot, month, midway, mohammed, minuet, mantidae, muddied, meat, mote, Mothy, matte, mut, mud, minuend, maimed, manatee, mete out, med, motet, muhammad, MOAD, Mutawa, moment, matthew, mutate, maid, mt, Mete, muted, monad, mediety, mahomet, mint, matted, mowed, mood, muddy, myth, math, manhunt, mated, moot, meth.